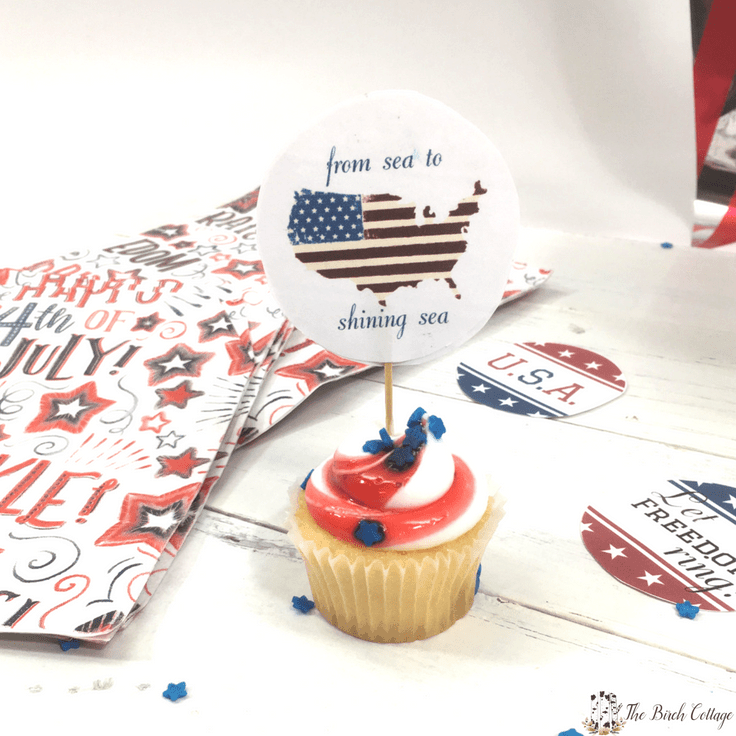 These patriotic cupcake toppers add the perfect touch of red, white and blue to your Independence Day family gatherings. Hello, Ideas for the Home by Kenarry™ friends! I’m Pam from The Birch Cottage and I’m back again this month to share yet another DIY project with you. When we get together for family picnics and 4th of July cookouts, I love to make cupcakes. Cupcakes are the perfect dessert because they require no plates or dishes and they’re perfect for little hands, too. 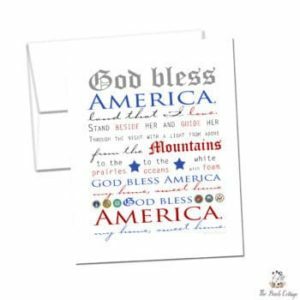 Plus, when you top your cupcakes with these patriotic cupcake toppers, they add an extra festive touch to your Independence Day gatherings. 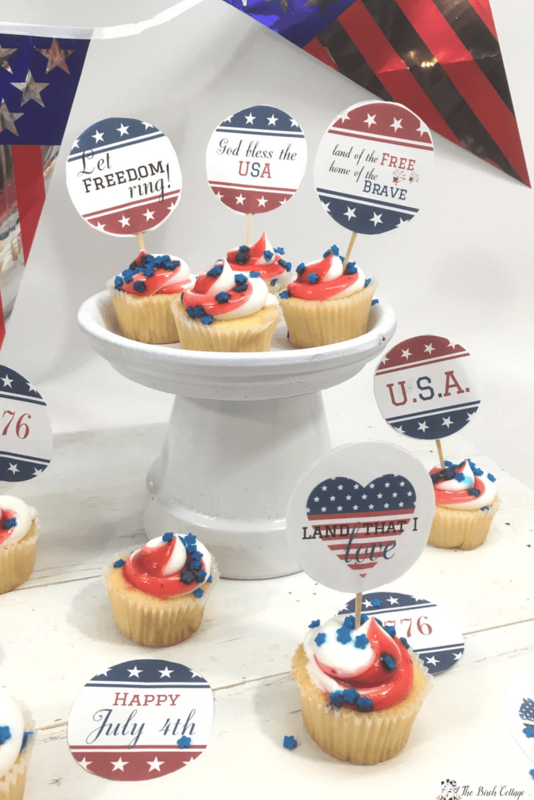 But, these patriotic cupcake toppers aren’t just for cupcakes! You can put them in just about any dish. Put them in your hamburger or hot dog buns. Put them on your fruit skewers. 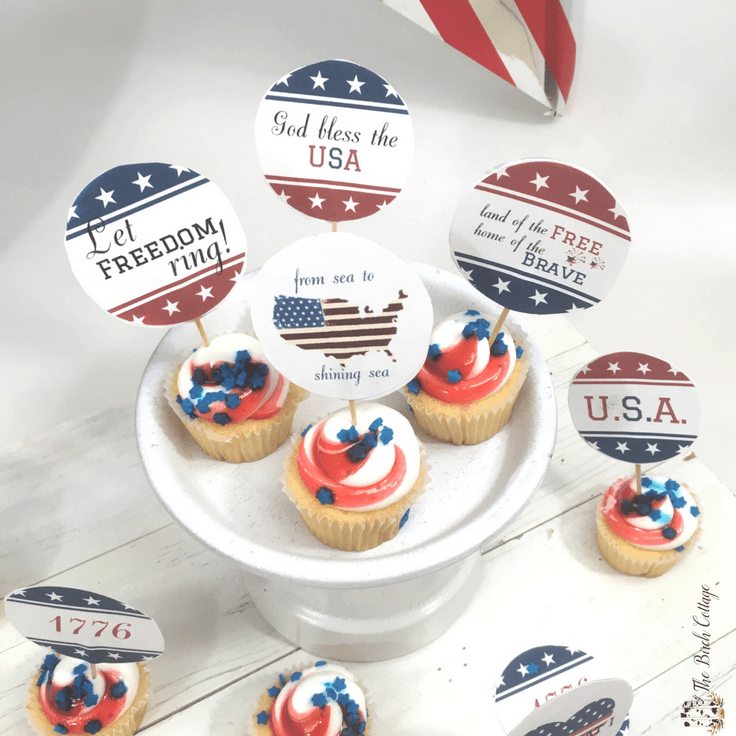 You can even top off your cocktails with these patriotic cupcake toppers! 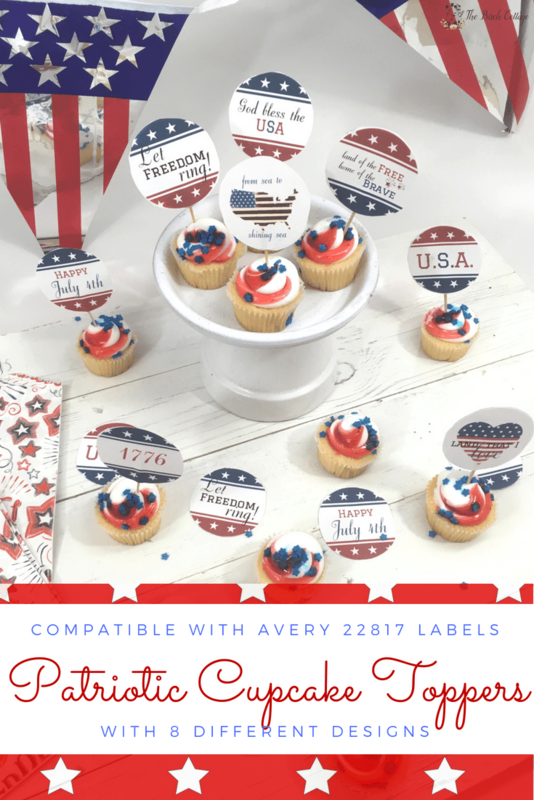 Print the toppers using Avery 22807 2” Round Labels (or you can print on paper and cut out the 2” circles). The adhesive labels make this project so simple and flawless! Select one label and place a toothpick or skewer partly onto the adhesive side of the bottom of the label. Adhere another label on top of the toothpick so that two labels are stuck together. Your cupcake topper is made and ready to be inserted into your cupcakes or other food items. This four-page PDF is available as a free download when you sign-up below! 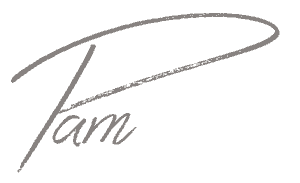 Once you’ve confirmed your e-mail address, we’ll send you the free digital printable. 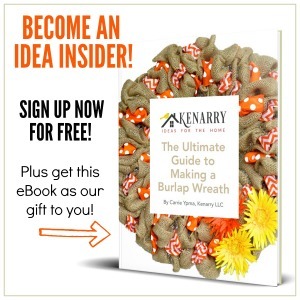 Plus you’ll have the opportunity to get our weekly Ideas In Your Inbox newsletter as well as access to our resource library stocked with free printables, product discounts and other content that is EXCLUSIVE for Kenarry Idea Insiders only. Then you just need to download the PDF file and save it to your computer. 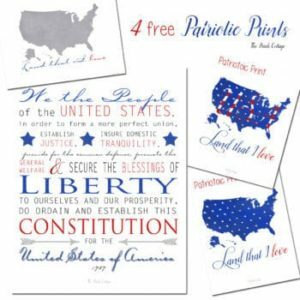 These Patriotic Cupcake Toppers and all other free printables from Ideas for the Home by Kenarry™ are for your own PERSONAL USE ONLY. Although I used my toppers with mini-cupcakes, you can certainly use them with regular or even large cupcakes. In fact, if you’re looking for some new cupcake recipes to try, you might like these Carrot Cake Cupcakes or how about these cute Raccoon Cupcakes or for a healthier treat, try these Chocolate Chunk Muffins! 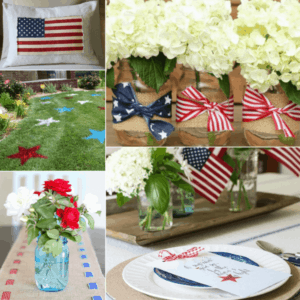 Like I said, feel free to use these patriotic cupcake toppers in your hamburger buns, fruit skewers, drink straws or to simply add some red, white and blue to your tablescape. 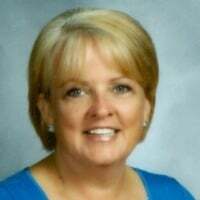 Follow Pam on Facebook, Twitter, Pinterest and Instagram. To get the printables, just sign up using the form within this blog post or you can go to https://www.kenarry.com/subscribe. 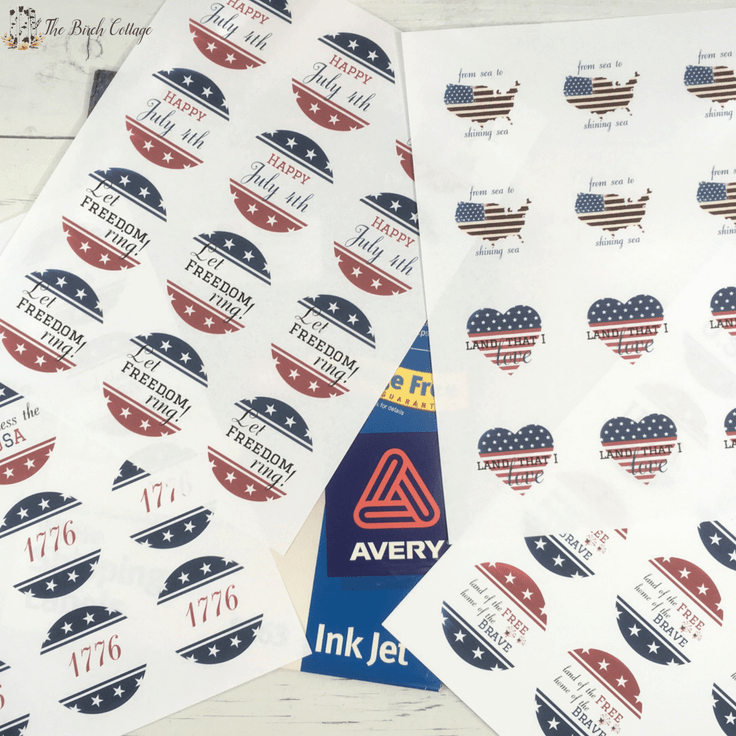 Once you’re signed up to be a Kenarry Idea Insider, you’ll get access to our Idea Insider Resource Library where you’ll find these Patriotic Cupcake Toppers plus loads of other freebies just for our subscribers.